Nancy Bush owns and operates The Wooly West. She started this wool business after returning from time abroad in the early 1980's. 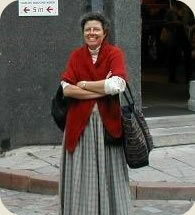 Nancy lived in Europe while attending weaving school in Sweden and working as a nanny in France. Nancy Bush found her passion in knitting. She chose knitting as a primary focus, because of the portability of it (as opposed to weaving) and the accessibility to everyone. Through her company and highly popular books, Nancy Bush has encouraged more folks to knit than she ever thought possible. Her goals have always been to offer fine natural fiber yarns, classic and traditional patterns, useful knitting tools and expert instruction to her customers. Nancy Bush lives in Salt Lake City, Utah.